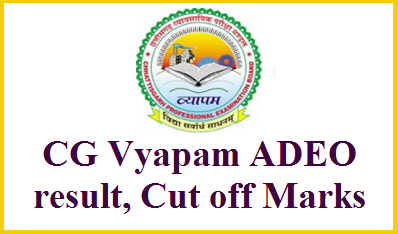 Latest Updated on 24.10.2017 : CG Vyapam has released the ADEO Exam Admit Card & Exam date…………………Now the Exam will be happened on 29.10.2017………………..Download the Hall Ticket/Call Letter through the Link Given below…………………. About Exam : All those Candidates who filled there Online Application form Successfully will Face the Exam. The Exam will be Conducted on the Prescribed Exam Centers. The Date of Examination is 29 October, 2017. The Exam will be Written Type. Admit Card : All the Candidates who filled the Application Form will face the Exam. The Exam will be Conducted Soon for the above Vacant post as the Examination Date is Announced. Candidates who is going to face the Exam Should Download the Admit Card before Appearing in the Exam. Without Admit Card no one Candidate will face the Exam. The Admit Card will not be send to the Candidate it can be Download only from the Website. We will also provide the Direct Link to Download the Admit Card for Our Candidates. Here is the Link Provided Below to Download Admit Card. The Time Duration for the Examination Will be 03 Hours. Chhattisgarh Professional Examination Board Chhattisgarh has recently announce the Recruitment of 213 Posts of Sahayak Vistar Vikash Adhikari/ Assistant Development Expansion Officer (ADEO). Many Interested Candidates filled there Application Form for the above Vacant Posts. Candidates filled there Application form till the Last date 22-09-2017. Candidates Can Check the Detailed Recruitment from the Below Provided Link. About Exam : All those Candidates who filled there Online Application form Successfully will Face the Exam. The Exam will be Written Objective Type. The Exam will be Conducted on the Prescribed Exam Centers. The Date of Examination is 29 October, 2017. Nowadays study become very hard and the competition level become very tough. The Level of Competition is become Very High with the Passing of Time. Candidates Who is applying for the Above posts are worried about there Exam Exam so here So, here we are providing the latest Syllabus & Exam Pattern of Assistant Development Expansion Officer (ADEO) Exam conducting by CGPEB Raipur. General Knowledge (with special reference to Chattisgarh) : Current Events of National and International Importance. Constitution of India, Political System and Indian Administrative system. General Introduction of Chattisgarh, Geographical Location, Natural Resources, Industries, Education, Administrative Structure, History and Culture of Chattisgarh – Ancient History, Freedom, Struggle, Major Archeological and Tourist Center. Music and Dance of Chattisgarh. Tribes of Chattisgarh. Livelihood : Indian Agriculture and its role is rural economy Candidates Expected to study, Green Revolution, White Revolution, Mechanization of Agriculture and Animal Husbandry and their effect on rural Life. National Rural Livelihood Mission. Role of Rural Industries in Providing Livelihood. Institutional Development, Self Helps Groups, Types of Self Helps Groups and Procedure of its Formation. Project Management for Livelihood – co-operative and Banking System. Market- Definition, Types, Layout of local Market, types of intervention. Livestock Products and its Management. Panchayati Raj System : 73rd Amendment of Constitution and its features. Chattisgarh Panchayati Raj- Adhiniyam. Structure of three-tier Panchayat. Duties of Gram Panchayat. Gram Sabha. Permanent Committies of Gram Panchayat and its Duties. Major Schemes of Panchayat Sector. Chhattisgarh Professional Examination Board Chhattisgarh Invited the Online Application for the Recruitment of Sahayak Vistar Vikash Adhikari/ Assistant Development Expansion Officer (ADEO). The Eligible Interested candidates of Chhattisgarh can fill there Application form and Check all the details about Vacancy below. Age Limit : As On 01/01/2017 Minimum 20 years & Maximum 30 years. Educational Qualification : Candidates Should be Graduate from any Recognized University and Should be able to read and write Hindi. Application Fee : The Application Fees Will Be Accepted Through SBI Challan Form, Credit Card, Debit Card And Net Banking Mode. No Others Mean & Mode Of Accepting Application Fees. How to Apply : All the Interested Candidates can apply online for the Above Post No Other Mode will be Accepted. Candidates can visit the Website and Click on the Application Form then the Link of ON LINE APPLICATION FOR ADEO 17. Then select the Locality in yes or no and select Eligibility yes then the Application form will be available then the Candidates can fill them. The Application form will be accepted with the Application Fees. Also the Candidates can fill the Application form Apply Online Link provided below.